The Huawei Watch 2 doesn't have the same elegance that its predecessor had, but we mustn't forget that it's also aimed at a different target audience: athletes. Equipped with Android Wear 2.0, numerous sensors and an optional SIM card slot, the Huawei Watch 2 is well set up in theory. But, in practice, does it live up to everything it's set out to be? We reveal all you need to know about this smartwatch in our review. It's taken a little over two years for Huawei to present a new version of the Huawei Watch. This time, however, the company has opted to move away from luxury to focus instead on sport and fitness. This shouldn't come as a big surprise as Huawei is moving with the global market trend, which is taking smartwatches in this direction. The Huawei Watch 2 is expected to be released some time in April and will cost around $350. Color-wise, it will be available in Carbon Black, Dynamic Orange, Titanium Grey and Concrete Grey. The Huawei Watch 2 Classic will be available from May for $420 in Titanium Grey with a black leather armband. Depending on whether you opt for the classic variant or not, you'll get two completely differently built watches that both share the name of Huawei Watch 2. The classic model, which is made of metal and has a leather bracelet, wasn't ready for the first hands-on we did of the device at the MWC 2017, nor is it ready now at the time of our full review, never mind the Porsche version. Thus, we turn our attention to the normal, sporty Huawei Watch 2. The first Huawei Watch had an elegant metal casing with a thin frame and chic detailing. The new Huawei Watch 2 has a slicker and more dynamic feel about it. The design is a little reminiscent of the G-Shock watches from the 90s, but fits within the rest of the style. The plain black watch in particular is rather plain and looks a bit dull. The plastic used doesn't necessarily look high-quality, and the bracelets could be softer. The latter, however, can be switched out quickly and swiftly thanks to a quick release mechanism and standard width bracelet bracket. Like its predecessor, the Huawei Watch 2 is protected against water thanks to an IP68 certification so you don't have to worry about ruining your watch when you wash your hands or take a shower. This doesn't mean that you can swim with the watch though, or even dive with it. After all, the certification also applies to the LTE-enabled model that has a slot for a nano-SIM card. The metal bottom with pulse meter is held in place by four screws. The Chinese manufacturer installed an AMOLED display with 1.2 inch diameter and 390 x 390 pixels on the Huawei Watch 2. The first Huawei watch came with 1.4 inches and 400 x 400 pixels. On paper, the Watch 2 should be more compact and less bulky for athletes but unfortunately the opposite is true. 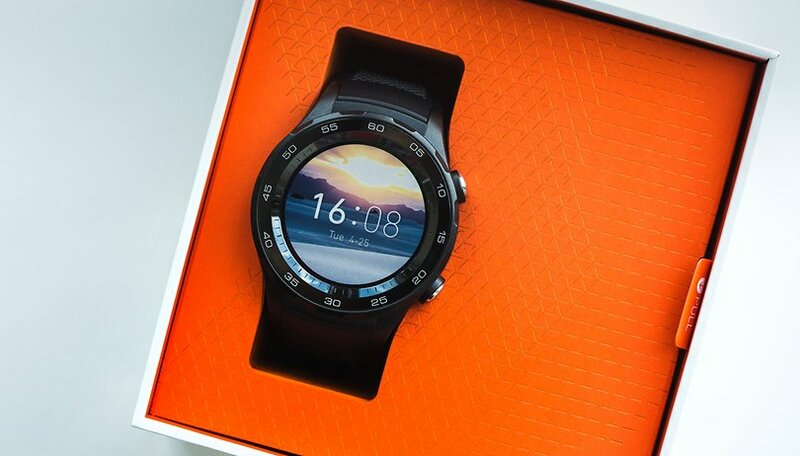 Huawei's new smartwatch is bigger due to the additional technology that has been installed in it. The screen of the Huawei Watch 2 is nice and sharp. The light green display from the first generation of the Huawei Watch is gone - the AMOLED panel of the Watch 2 doesn't have this greenish tone. Color representation is sharp and well contrasted. You can only see the pixels if you look very closely at the screen but in your daily use of the watch, you won't notice anything. The Huawei Watch's automatic brightness adjustment isn't anything to be particularly excited about. On the one hand, the display often reacts relatively late and on the other hand, it's too dark in bright sunlight and too bright in the dark. The lowest setting is like a small flashlight in a dark room, like in the cinema or your bedroom with the lights out - even in standby. You might therefore want to avoid placing the Huawei Watch 2 right beside your bed if you're sensitive to light. Huawei installed a GPS tracker on its second generation smartwatch. The watch is also available in an LTE-enabled version. The latter doesn't rely on the standard eSIM but instead uses a conventional nano-SIM card, which can also be used in a smartphone. The card slot is cleverly hidden behind the bracelet connector so the Watch 2 remains protected against water and dust ingress. The Watch 2 also comes with Wi-Fi, Bluetooth and NFC. An important feature for sports activity tracking is the ability of the Huawei Watch 2 to determine your VO2 max value. The watch also includes a step counter and a light-based pulse meter, naturally. If you want to use a chest belt to measure your heart rate, you can link it directly to the Huawei Watch 2 via Bluetooth and use it in the fitness app; Android Wear 2.0 is ready for this. The second button on the smartwatch can be used for a function of your choice. You can customize this by going into the settings under Personalization –> Personalize buttons. Training mode is set by default to match the character of the watch. Select the type of workout then press start. This is fast and stems from the fact that the training mode is actually often used. If you don't need or want it, just put another app on the button instead. LG introduced its new watches with a vertical navigation menu and maps you can zoom in on, which the Huawei Watch 2 doesn't have, however, this feature isn't particularly strongly missed in everyday life. That said, anyone who has ever used a Samsung Gear S2 or Gear S3 will be annoyed by the fact that the remarkably large bezel of the Huawei Watch 2 can't actually be used to operate the device - it's just an ornament. Android Wear 2.0 comes pre-installed on the Huawei Watch 2. The new wearable operating system is based on Android 7.1.1 Nougat, which has some neat additions on the first iteration of Android 7.0 Nougat. These are mainly standalone features - especially the fact that it comes with its own Play Store on the watch. We've actually looked in depth at all the features of Android Wear 2.0 in our review of Android Wear 2.0. In everyday life, I particularly like that Android Wear 2.0 is not obtrusive. There is no "Ok Google" on the display, there aren't any constant notifications taking up most of the display, everything is fairly discreet. You can also launch functions like heart rate measurement or workout recording directly from the dial. There are now a lot of apps listed in the smartwatches' own Play Store - some more, some less useful. Also, more hip apps like Citymapper are available in the watch store. You can search either by language - this actually works quite well - or using the small keys on the screen keyboard - which is quite fiddly. For messaging, a practical feature is that you can also use prefabricated answers. Under the hood, the Huawei Watch 2 has a Snapdragon Wear 2100 processor and 2 GB of internal storage. The hardware on the watch has changed very little from its predecessor, but in everyday life, you barely notice any difference. Overall, the Huawei Watch 2 is not exactly one of the fastest smartwatches out there, there are minor lags and some functions take longer than on other smartwatches. The Huawei Watch 2 works well as a sports device. The GPS signal isn't found as quickly as on a smartphone or some other watches, but once it's found, it's stable and doesn't misfire. However, it also isn't as accurate as some of the best smartwatches in its range. The continuous pulse measurement is useful during activity and everyday life but the most accurate results are obtained when the watch is strapped tightly around the wrist. A word of caution though: If your wrist is bent at an angle, it'll be difficult to get a correct pulse measurement reading from the smartwatch. Only once did the Huawei Watch 2 encounter a significant obstacle during activity tracking. I had actually cycled about 9 kilometers but the watch told me I'd only done 0.81 kilometers, and it also said the training intensity was "too high". Otherwise, the activity tracking works well, and the simplified display of the training summary at the end of each workout is a really useful, especially for beginners. The Huawei Watch 2, like its predecessor, is equipped with a hands-free kit. Fast phone calls from your wrist without requiring a smartphone or headset are possible, although there is still room for improvement here. Particularly noisy environments hamper wrist phone calls quite a bit, but in an emergency, it's a decent option. But honestly, you'll find it more convenient to connect a Bluetooth headset, and that way your phone calls remain private. Another nice touch is that you can use the smartwatch as audioplayer. The Huawei Watch 2 with Android Wear 2.0 offers the possibility to either use the phone's SIM card or the watch's SIM card for phone calls. The Huawei Watch 2's battery life specs sound fantastic and too good to be true. "Up to three weeks in Watch Mode", stated the press release, and ten hours in "Traning Mode". For "normal use", the battery lasts up to two days. However, we only managed to get two days out of it if the watch had no SIM card inserted and only had Wi-Fi and Bluetooth enabled, and then only barely. With an active SIM card, the Huawei Watch 2 will need to be charged every evening. You can save a little battery power by deactivating automatic waking when you move your wrist, and only wake the watch by pressing the button. In Watch Mode, which turns the smartwatch into a pure watch with step counter displays nothing but the time, and this must be activated manually in the battery settings. In the mode, the display is dark here and only wakes up when you raise your hand to your face to read the time. Clearly, this increases the run time massively, albeit at the expense of almost all functions of the Watch 2. The battery can store 420 mAh. The charging cradle is quite similar but not the same as the predecessor's. With larger pins and the edges on both sides of the dock, the new Huawei Watch 2 sits much more securely in the charging cradle, thus it feels more robust than its predecessor. The Huawei Watch 2 is a refinement of the watch we met in 2015. LTE and GPS are necessary additions; the second physical button is quite handy in everyday life, although it looks a bit unusual. The Huawei Watch 2 comes with Android Wear 2.0 software, but the predecessor will also get an update to the latest Android OS. The Huawei Watch 2 is a well-equipped smartwatch with many functions that work well in everyday life, so long as you aren't underwhelmed by the unpretentious appearance and not particularly noble material. There are some small details like the display's automatic brightness control not being very good, the GPS being somewhat inaccurate and some minor hiccups during the operation that cast a small shadow on one's overall impression of the device, but you get used to these pretty quickly. Haha that is a very nice watch. Android os awesome. Are they really selling the non-LTE version of the watch for $420? Does the metal casing really cost more than the LTE capability?